Hydro turbines are increasingly required to operate outside their best efficiency point (BEP) in order to meet network demand. Such operation affects turbine efficiency and decreases asset life. 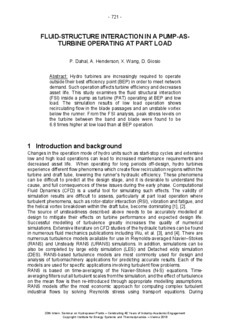 This study examines the fluid structural interaction (FSI) inside a pump as turbine (PAT) operating at BEP and low load. The simulation results of low load operation shows recirculating flow in the blade passages and an unstable vortex below the runner. From the FSI analysis, peak stress levels on the turbine between the band and blade were found to be 6.8 times higher at low load than at BEP operation.